The Deniliquin Aero Club is hosting a weekend of aviation at Deniliquin Airport from Friday 22 to Sunday 24 March 2019. The theme for the weekend is to recognize the importance of NO 7 Special Flying School, Deniliquin during World War 2. The weekend commences with a BBQ at the Aero Club on Friday from 6:30 pm with a BBQ. On Saturday there will be an air show which starts from 12:30 pm. 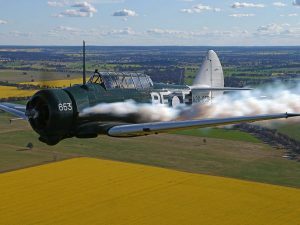 This will feature the Temora Air Museum Wirraway aerobatic display, as well as YAK formation flying and demonstrations of fire bombing and agricultural flying. During the afternoon the Edward River Band will be providing entertainment. There will also be vintage car displays and more to look at. On Saturday evening there will be Hangar Dinner with a guest speaker. The following morning the popular $10 Sunday breakfast start from 8:00 am. Would you or your local Aero Club or Flying Group like to participate in our annual calendar of Fly-Aways and Air-Safaris?